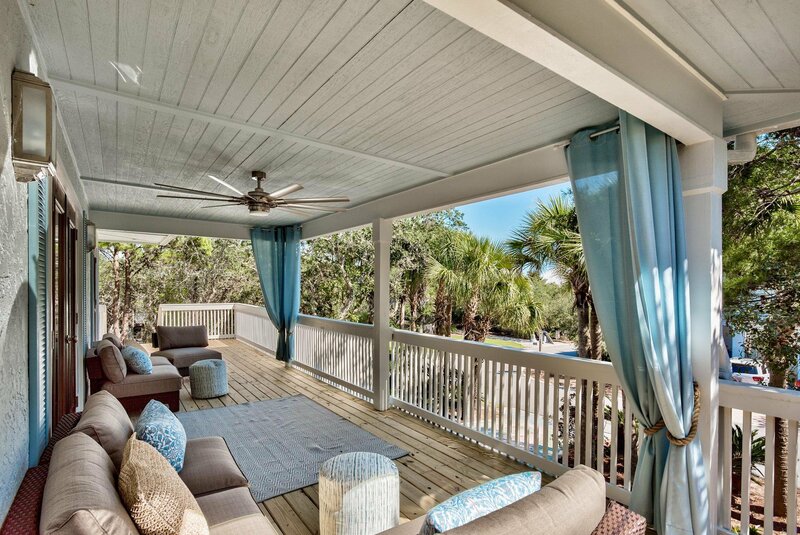 WELCOME HOME to your DREAM Beach oasis! 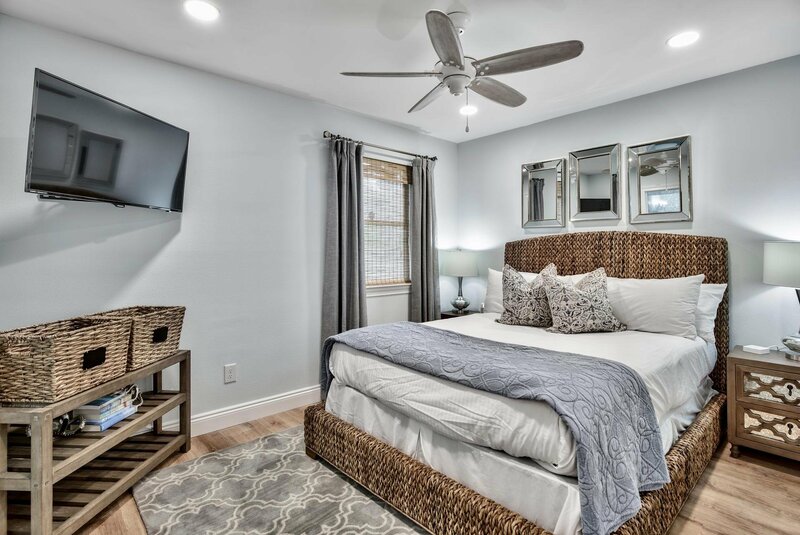 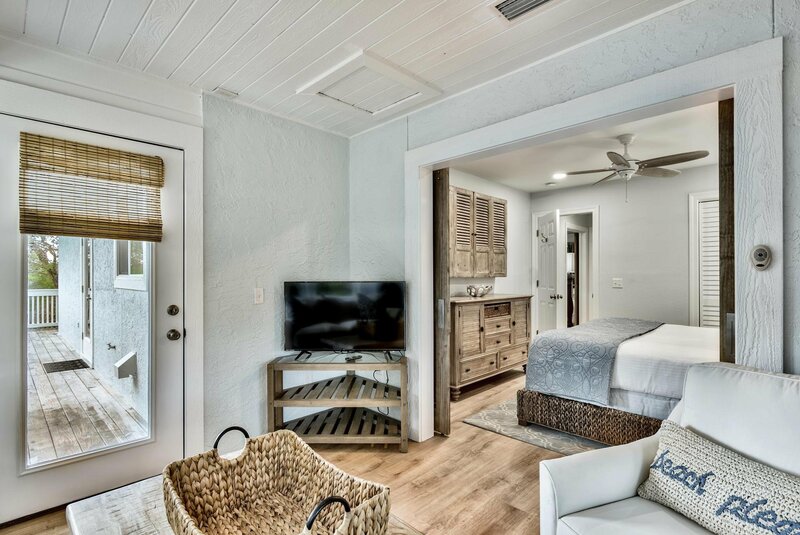 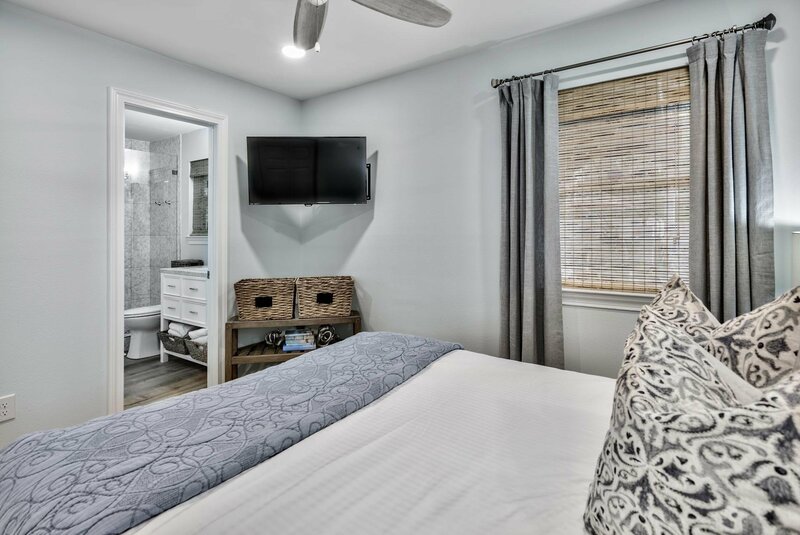 From the moment you step into this newly renovated masterpiece, that has been completely redesigned for maximum comfort and beauty, you will feel at home. 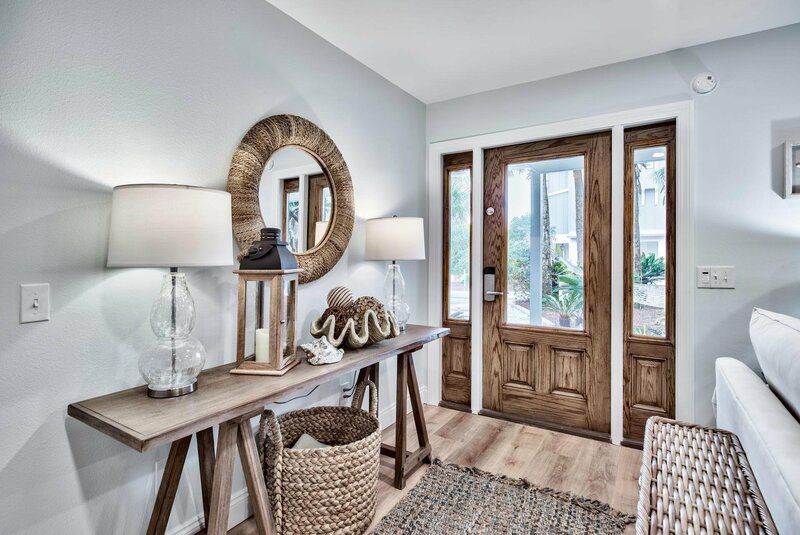 Just like new, from the new roof, 'LifeProof' 100% waterproof core plank flooring in warm wood tones to the new baths, rooms, kitchen, appliances, this home is perfect!Artfully redesigned to accommodate multi-family retreats, the living areas and spaces for relaxing are remarkable!Featuring first floor entrance into a very spacious living/dining area with mini kitchen. 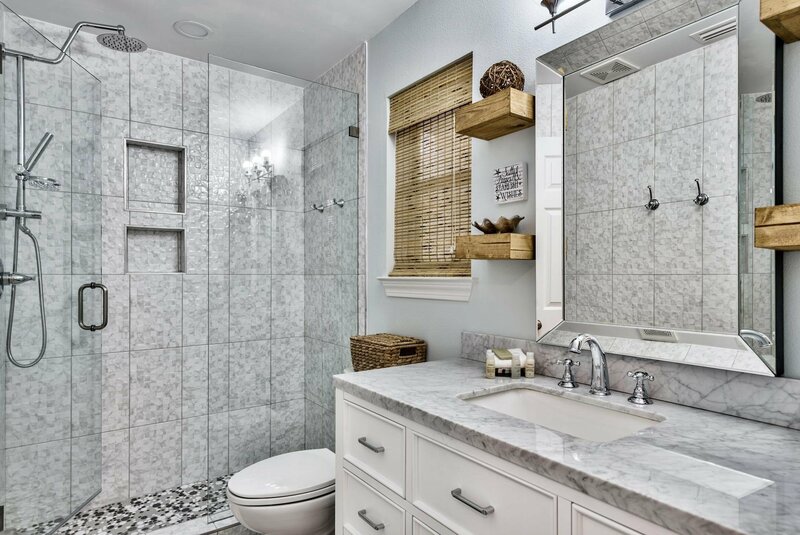 Elegant full bath. 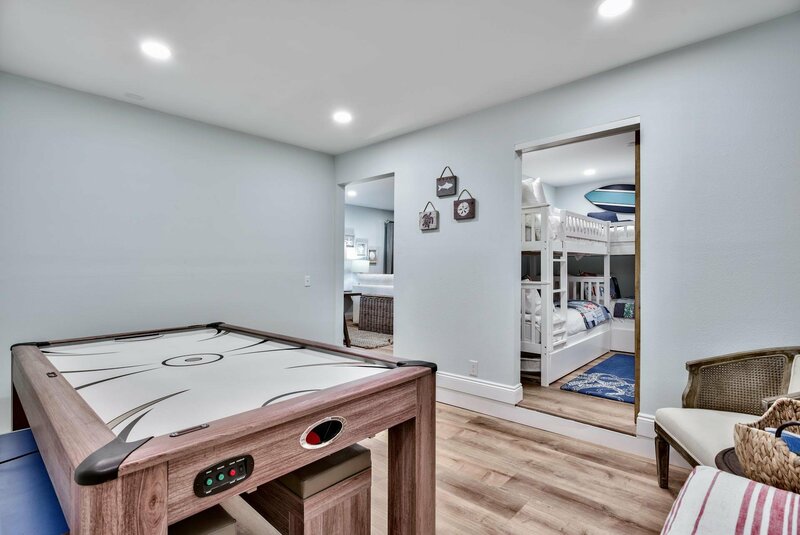 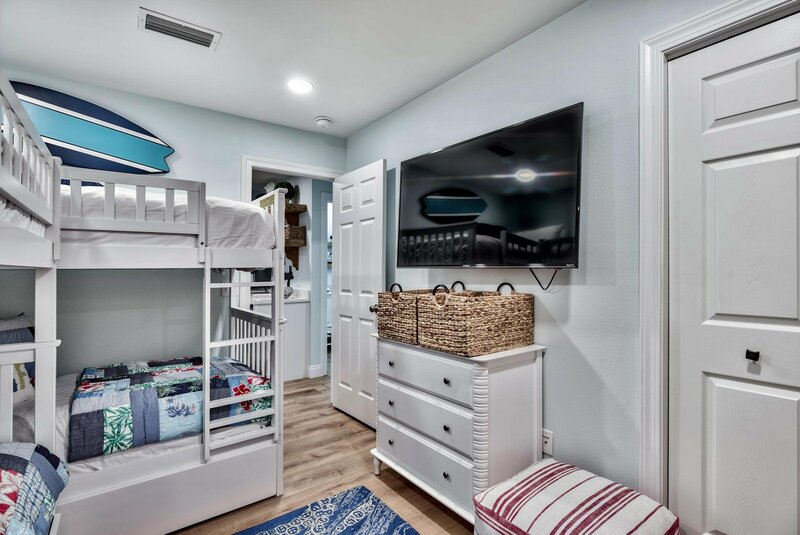 Separate bedroom with private bath, additional bunk room, super fun game room, large laundry for complete living area. 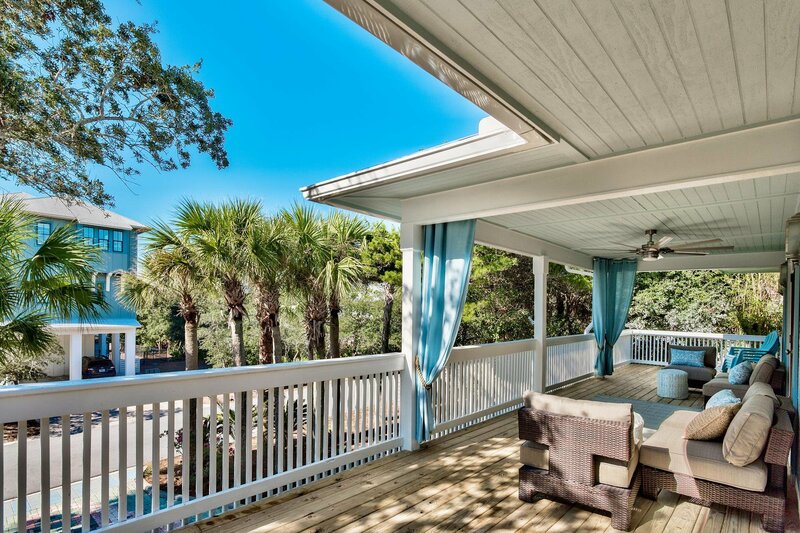 Second floor opens to open concept living, doors leading to the very spacious covered and open balcony (46' x 10'). 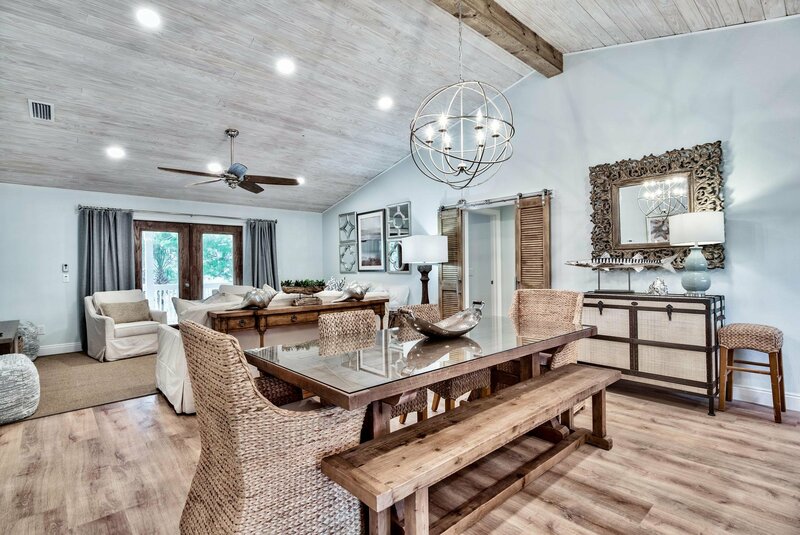 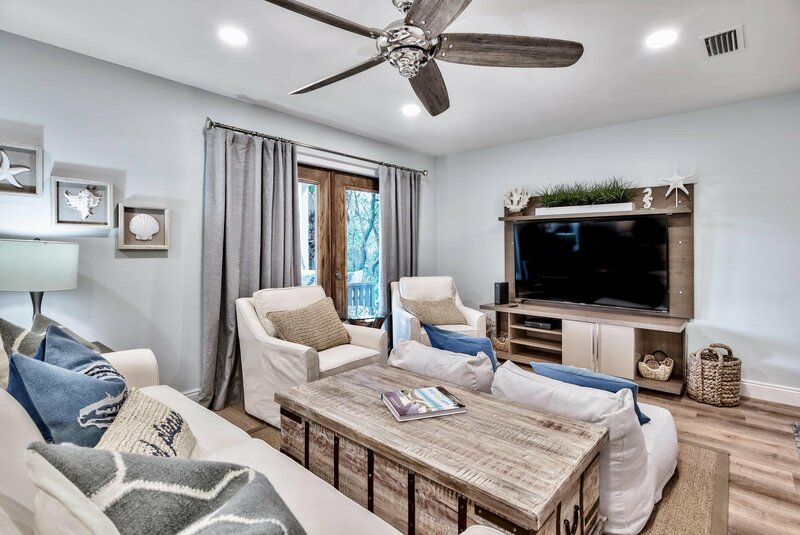 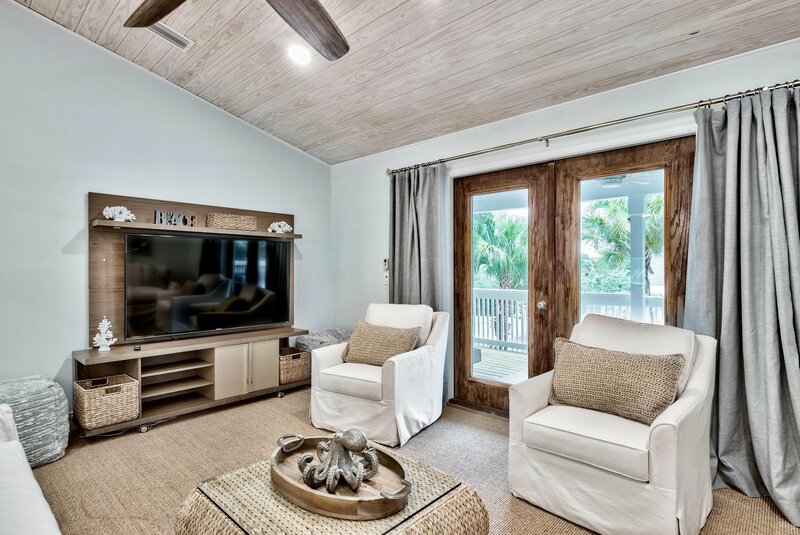 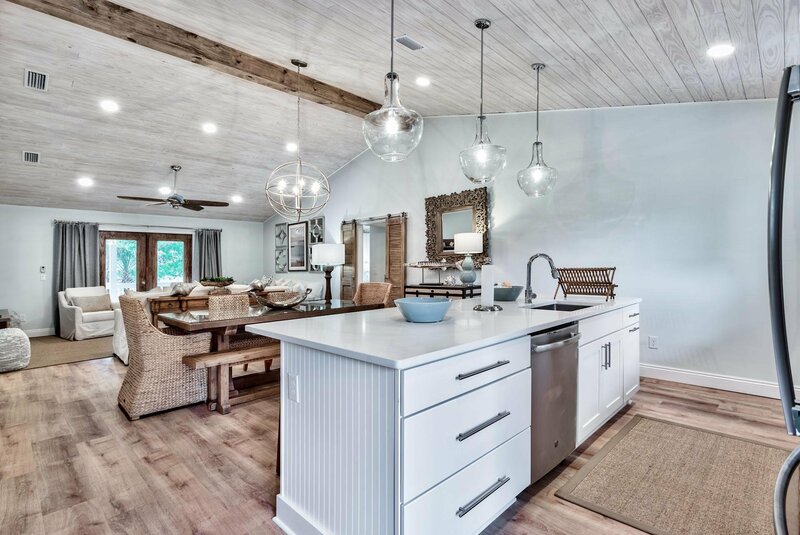 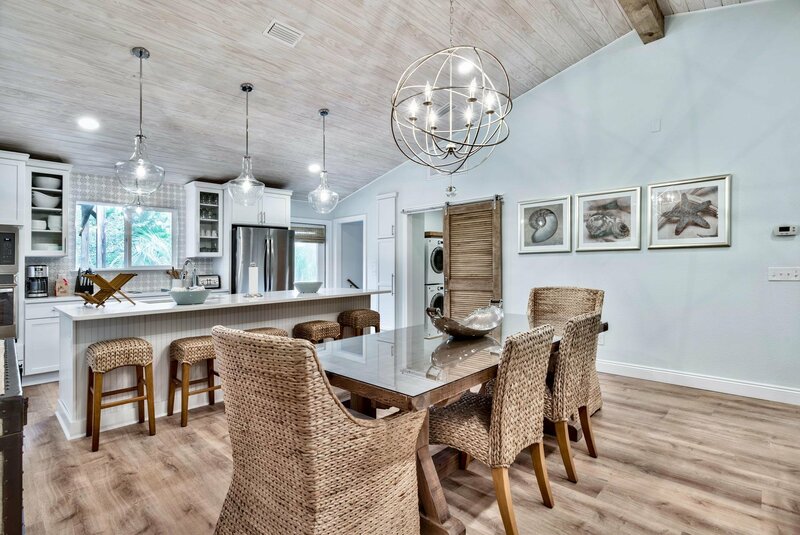 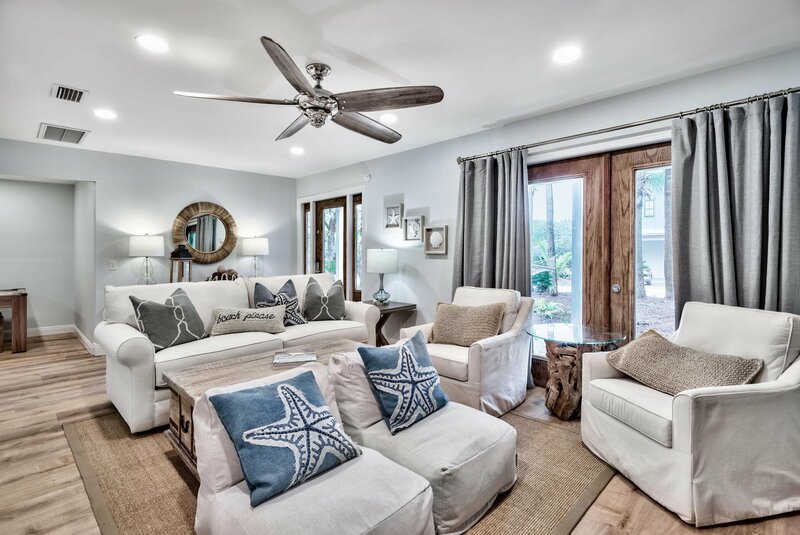 Vaulted beamed 6" V-groove wood ceiling makes the living area the place for entertaining. 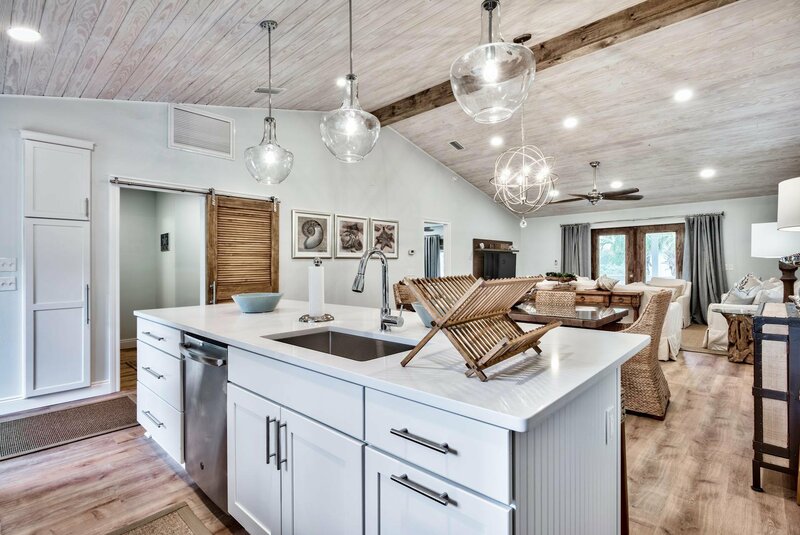 New kitchen includes 4'x10' white quartz island with Jenn-Air stove, convection oven, decorative glass tile back splash and window overlooking the pool, making the kitchen where everyone will want to be. 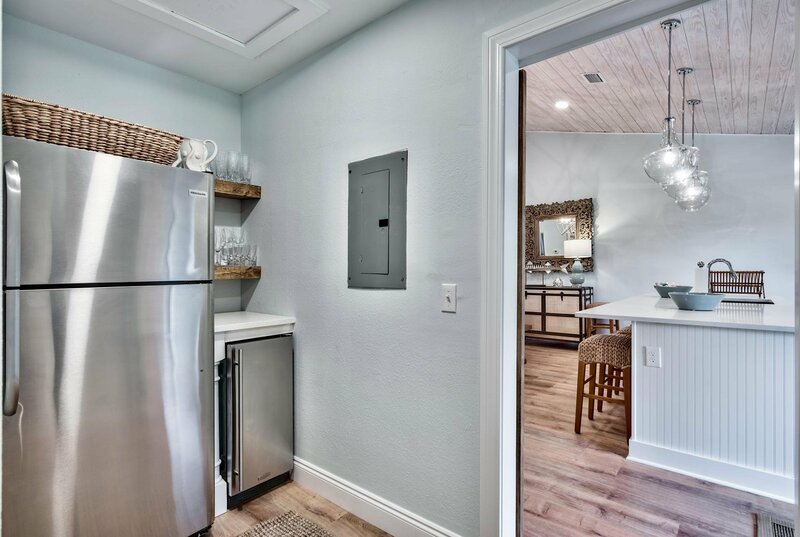 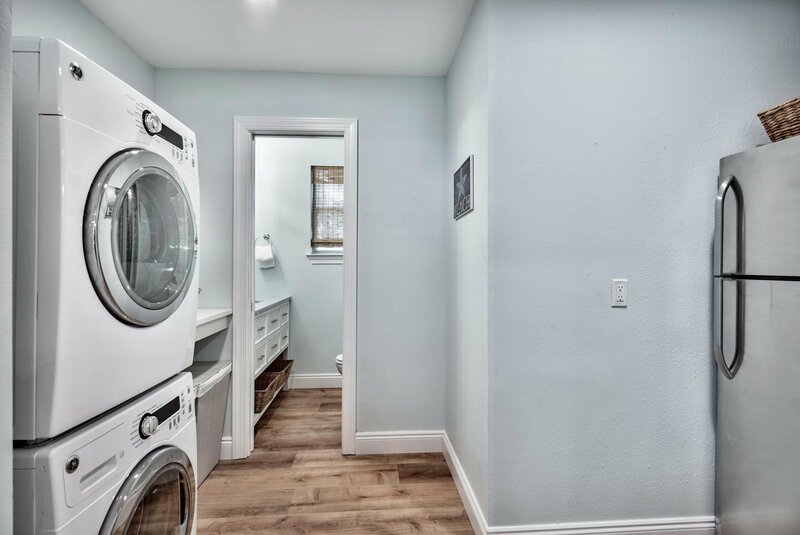 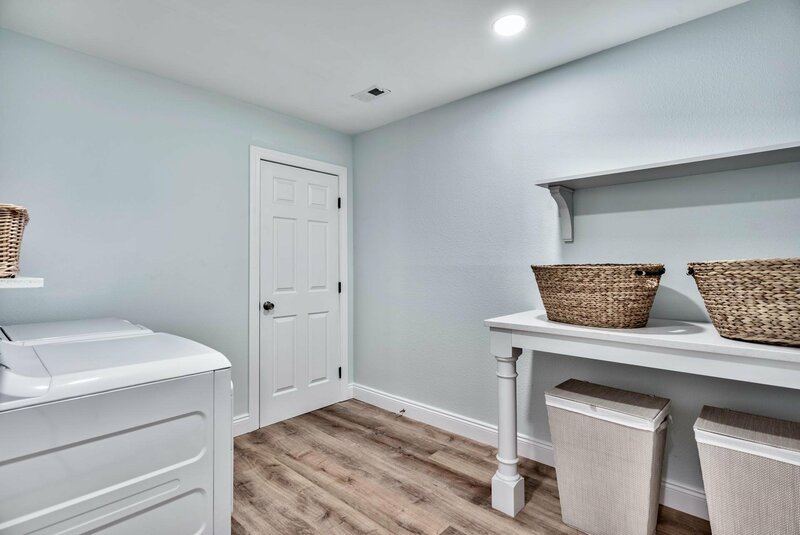 Adjacent laundry includes extra refrigerator, wine bar and icemaker. 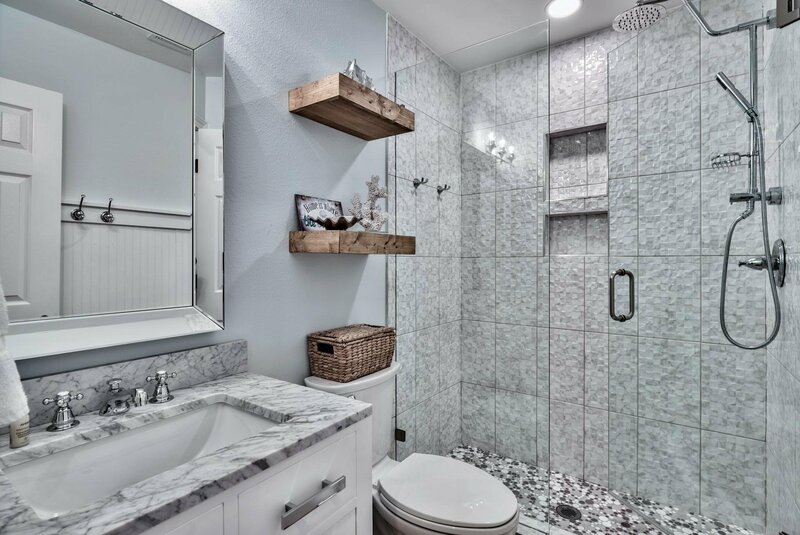 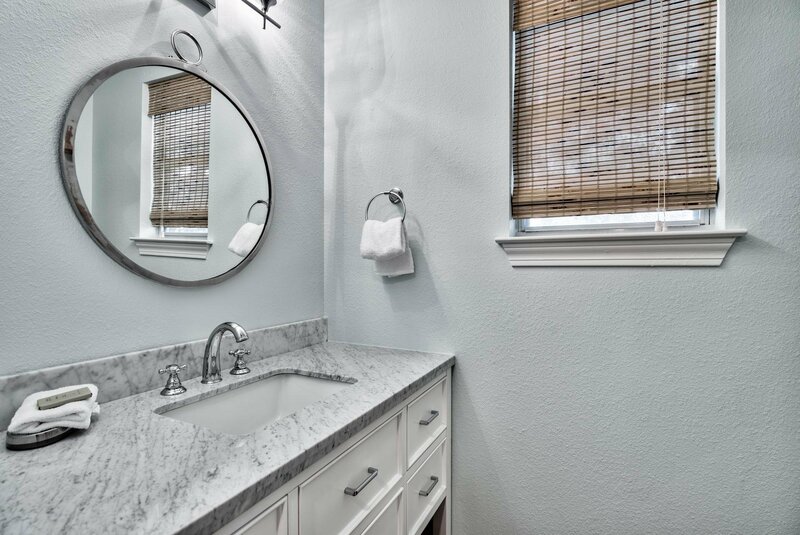 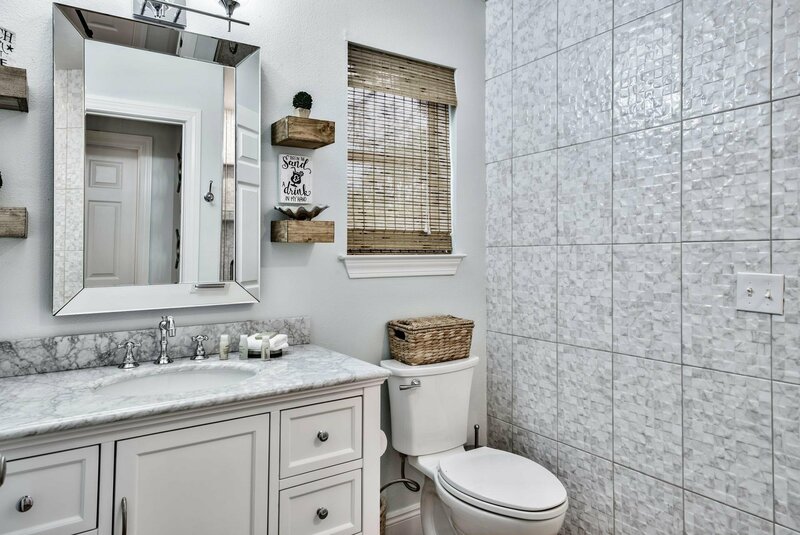 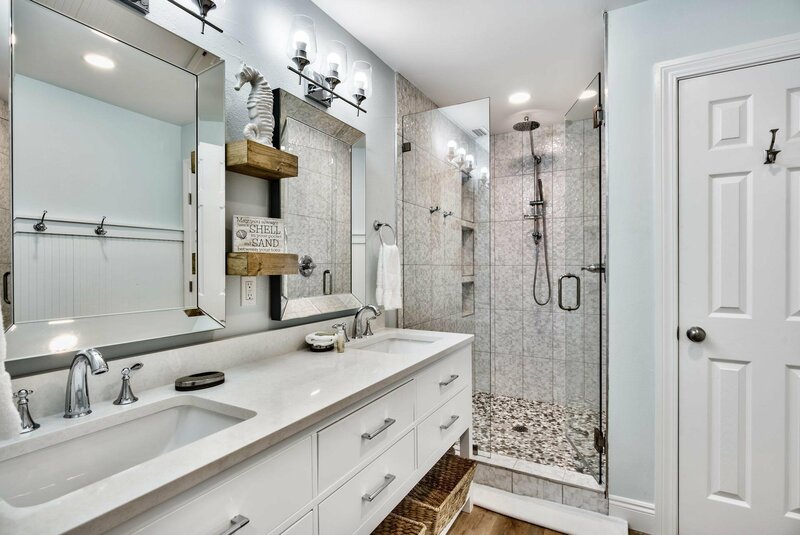 Lovely half bath has marble vanity. 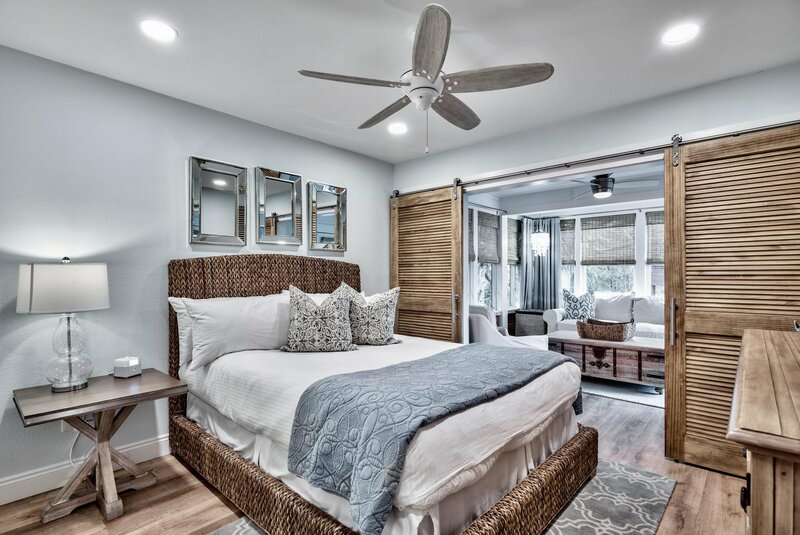 2 separate wings for bedrooms give home plenty of privacy. 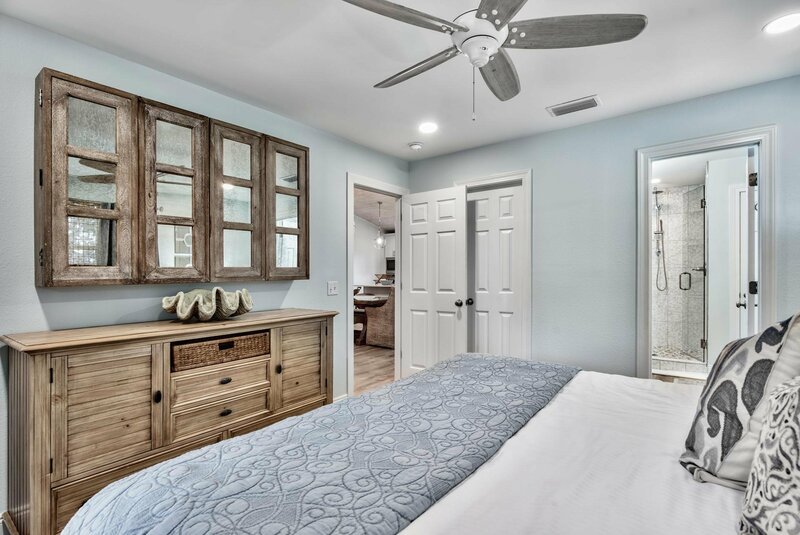 East master bedroom features king bed and ensuite bath with double quartz vanity and contemporary tile shower. 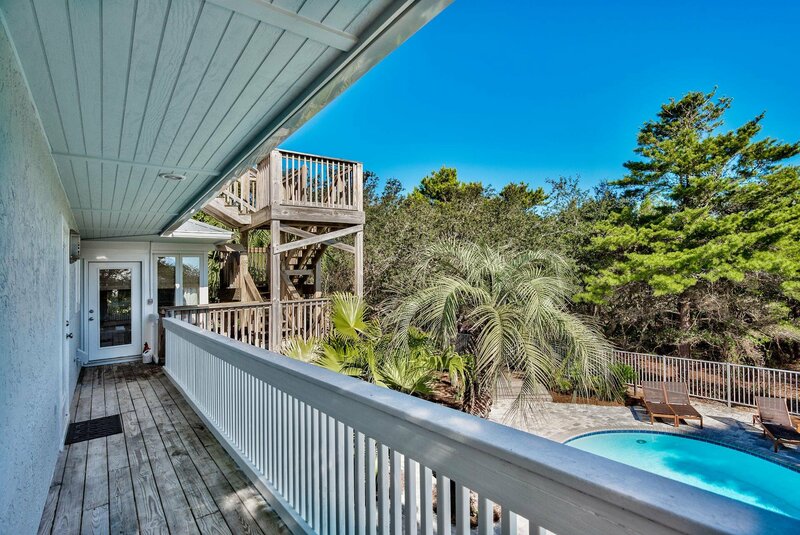 Double glass doors lead to the spacious balcony. 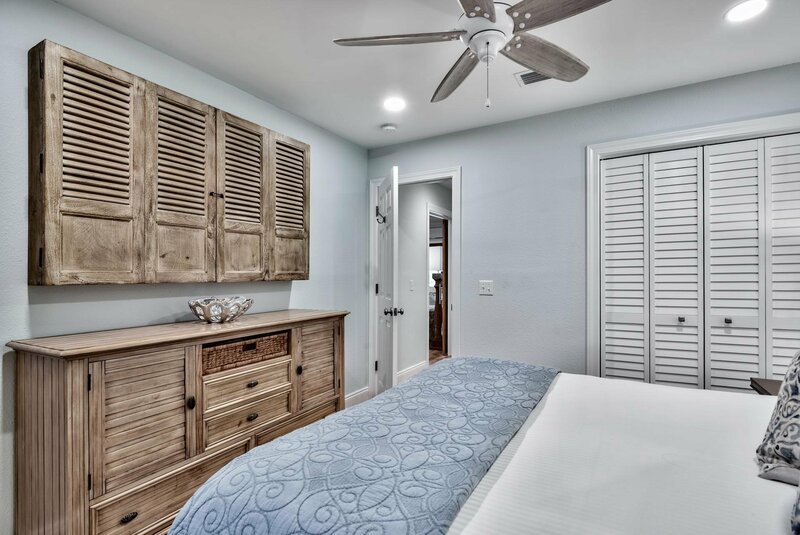 On opposite end of home is an additional suite featuring 2 more bedrooms. 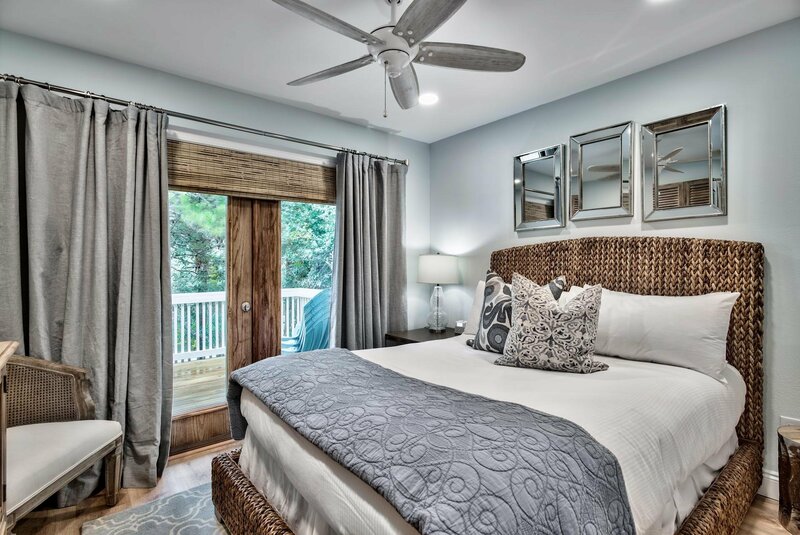 Front queen bedroom has glass doors leading to the balcony. 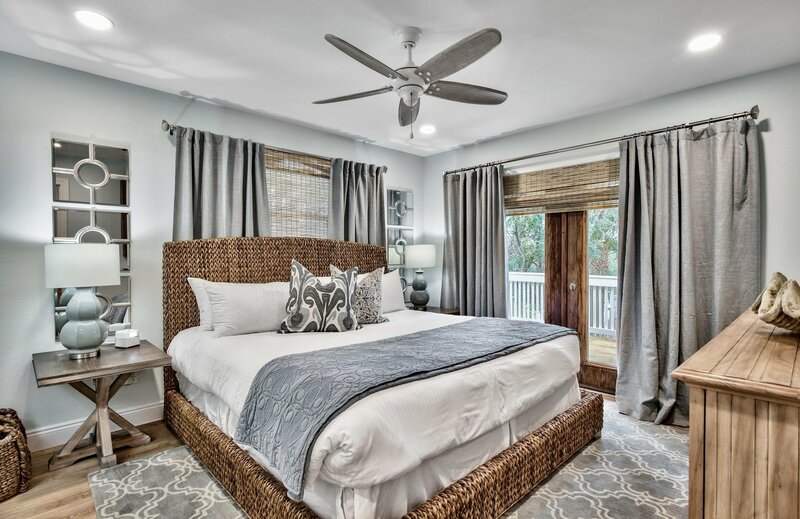 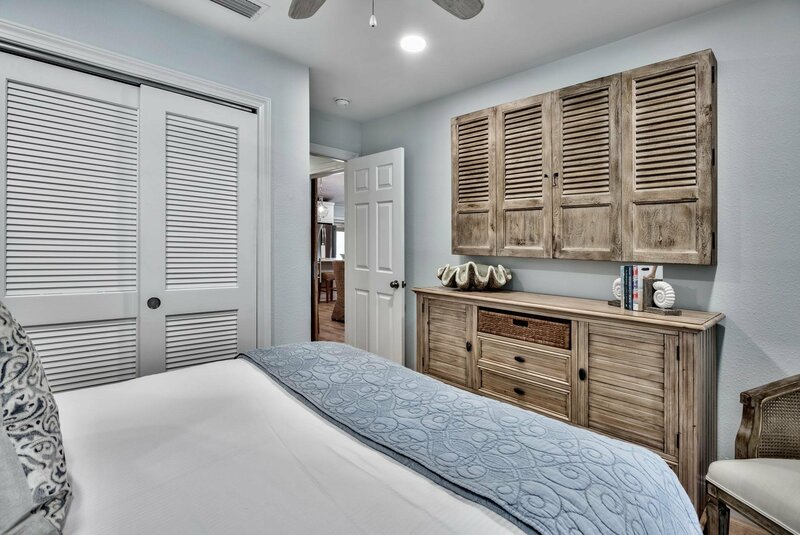 Rear bedroom features large sitting room encased in windows and decorative shutters overlooking the lushly landscaped back yard and inviting heated pool. 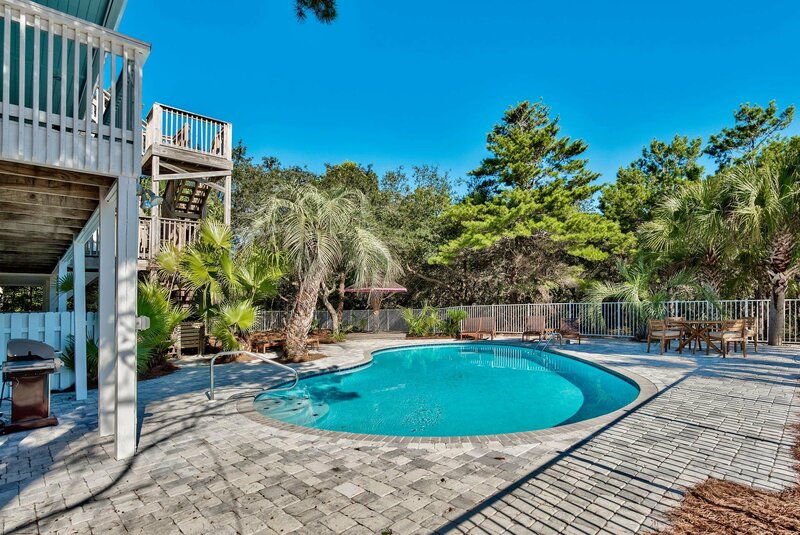 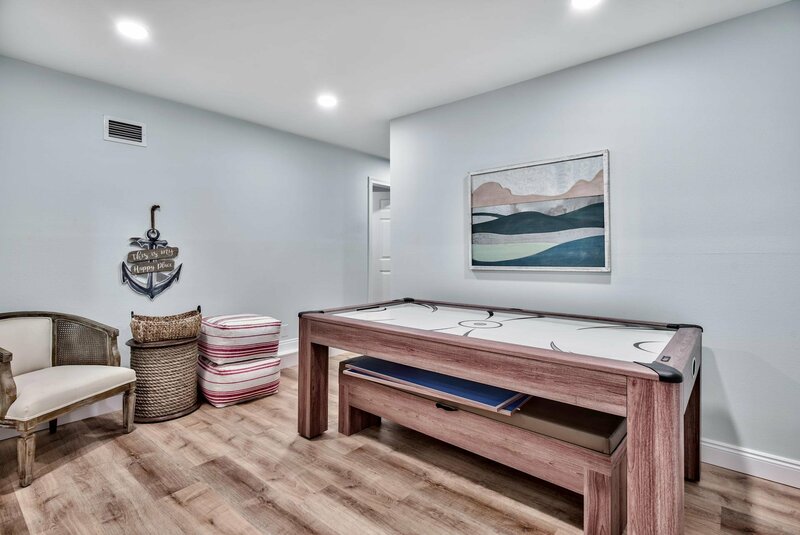 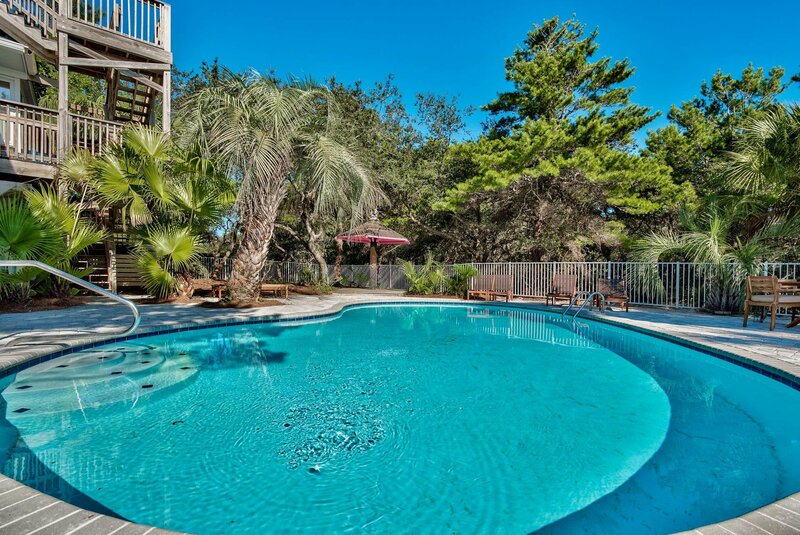 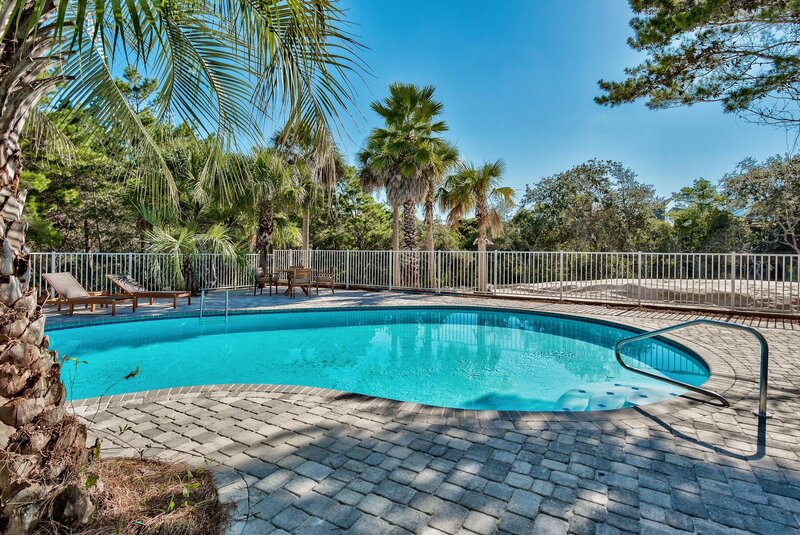 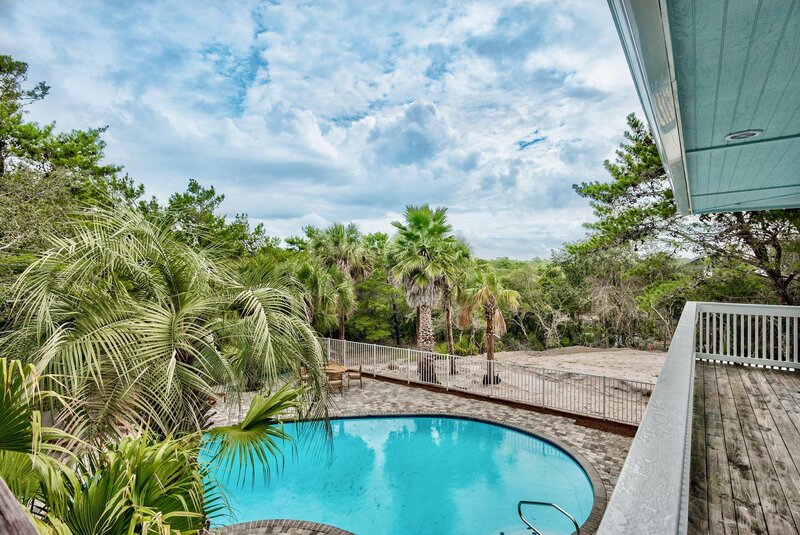 Backyard is made for fun times with quaint Tiki hut, plenty of spaces for lounging by the 38x22 kidney shaped heated pool or just relaxing under the palms. 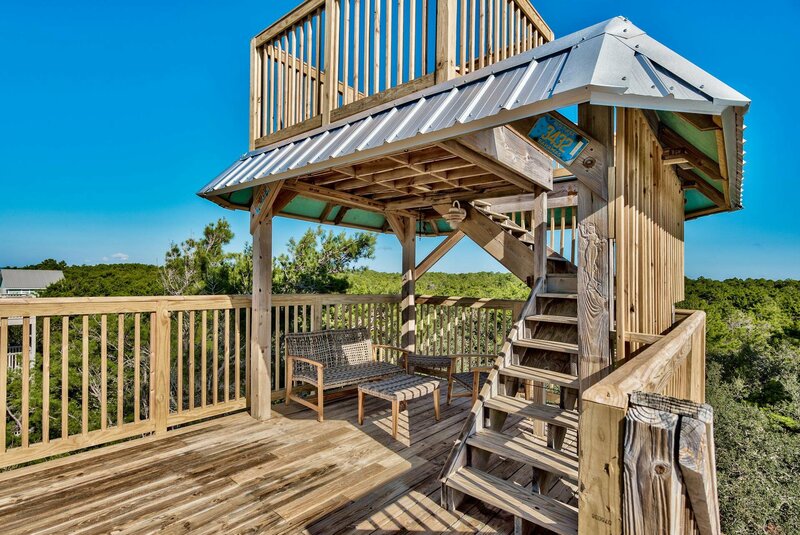 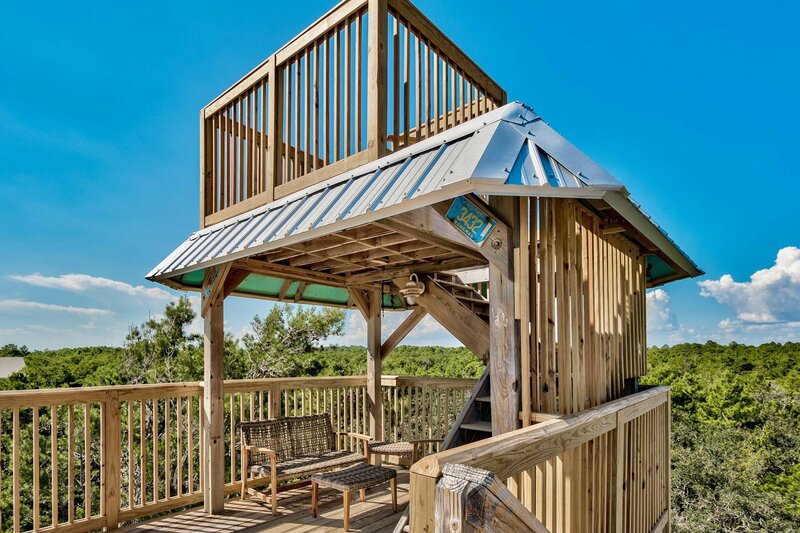 Multi-level tower has beautiful Gulf views. 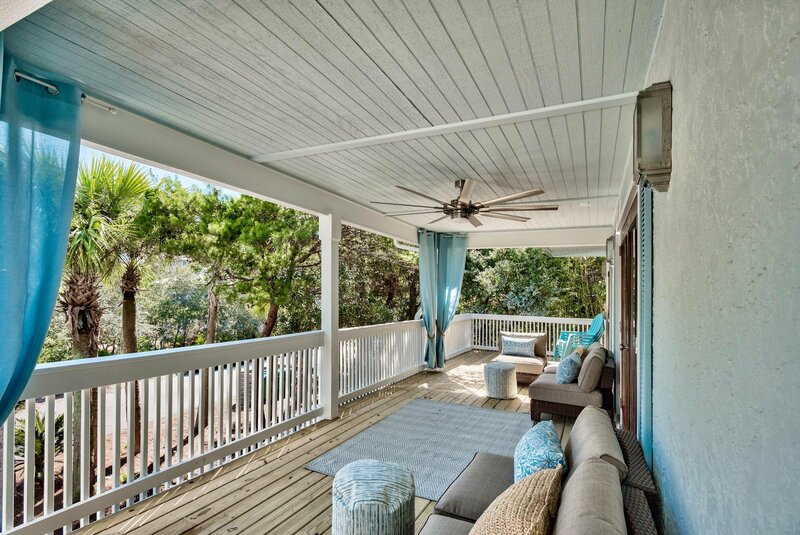 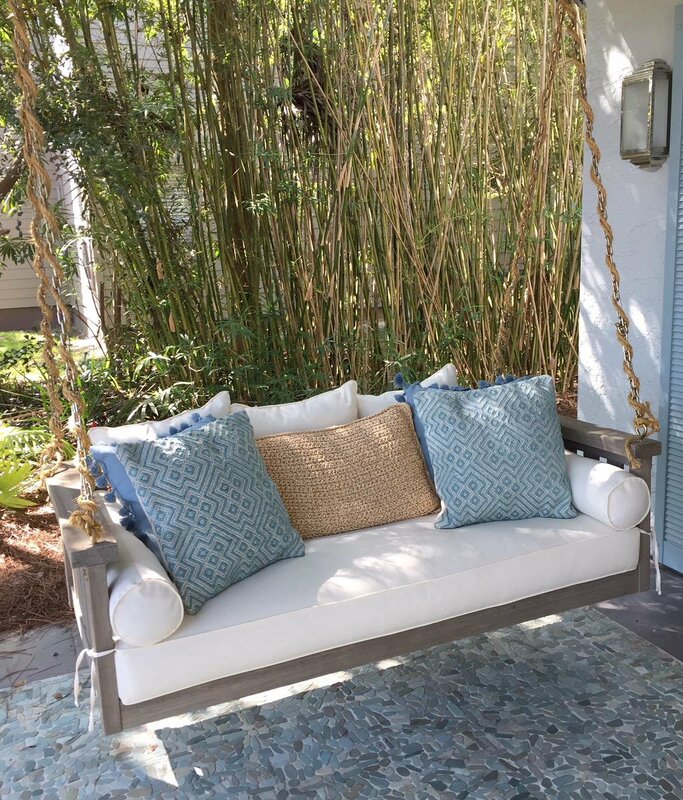 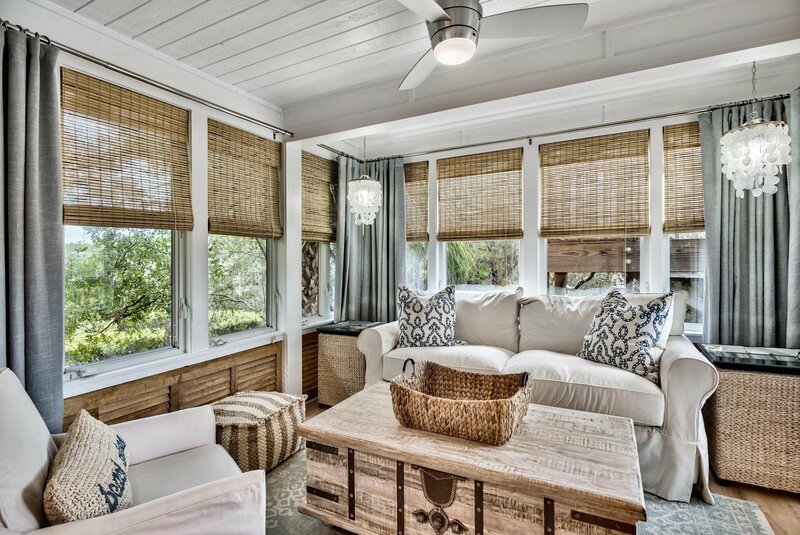 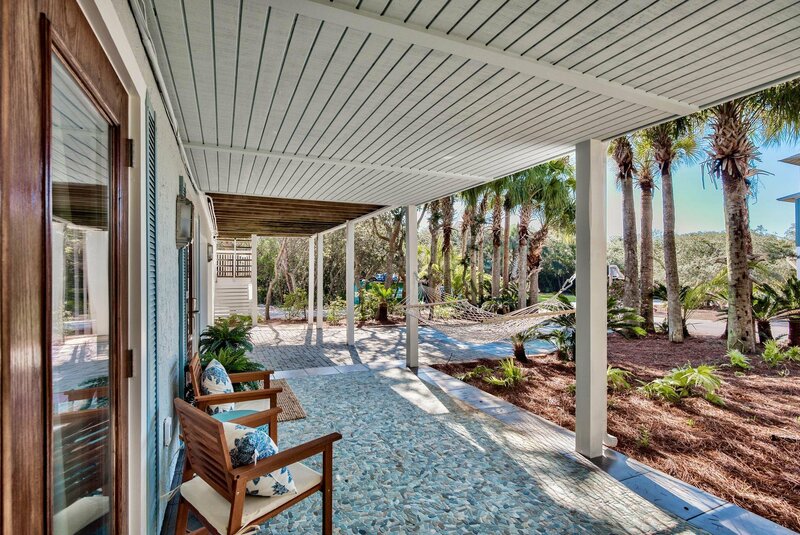 Front porch is perfect for reading or napping on the day bed or hammock while enjoying outdoor living. 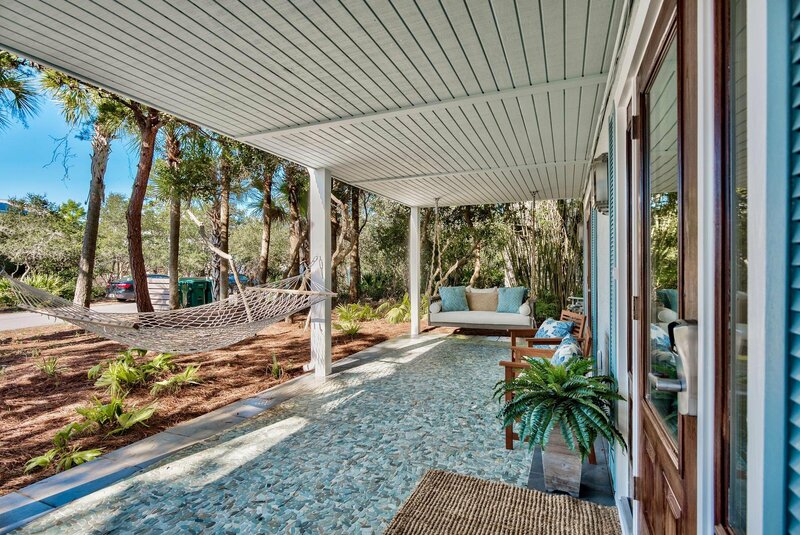 Garage is extra large for parking of a car, bikes, golf cart. 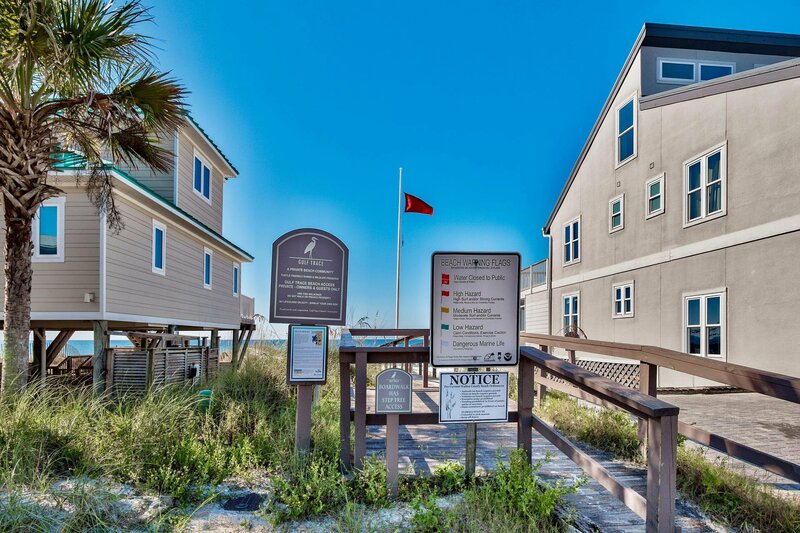 Gulf Trace is the most unique of all of 30-A's remarkable communities. 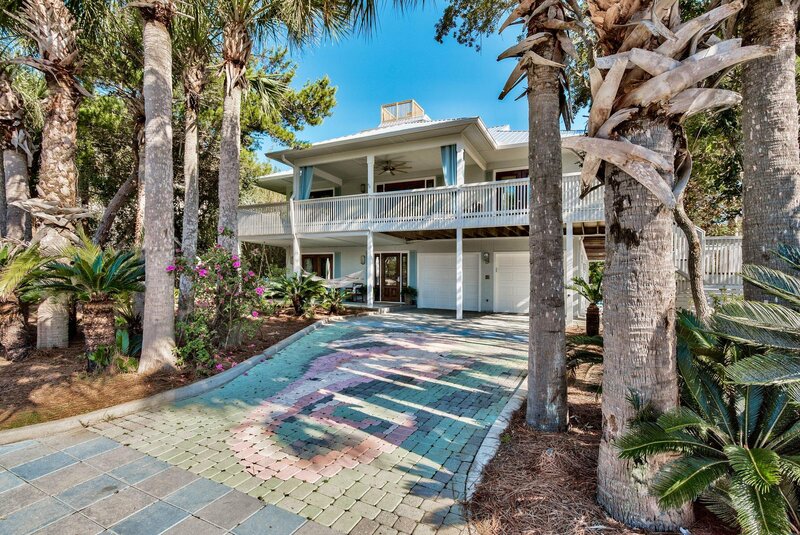 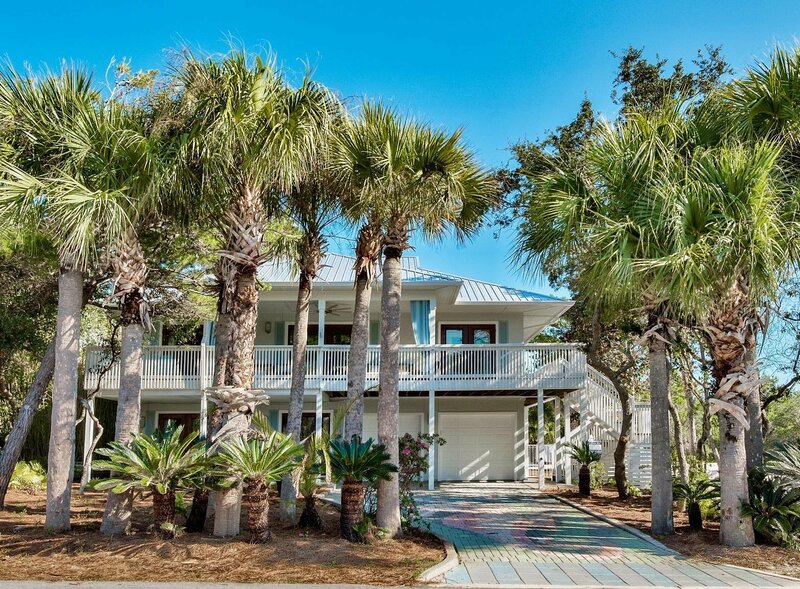 Gulf Trace is a serene private oasis surrounded on three sides by Grayton Beach State Park and fronted by the emerald waters of the Gulf. 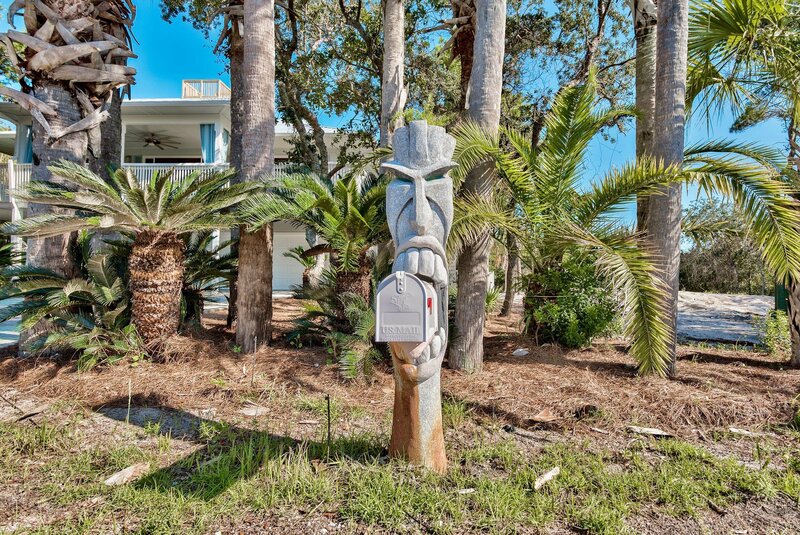 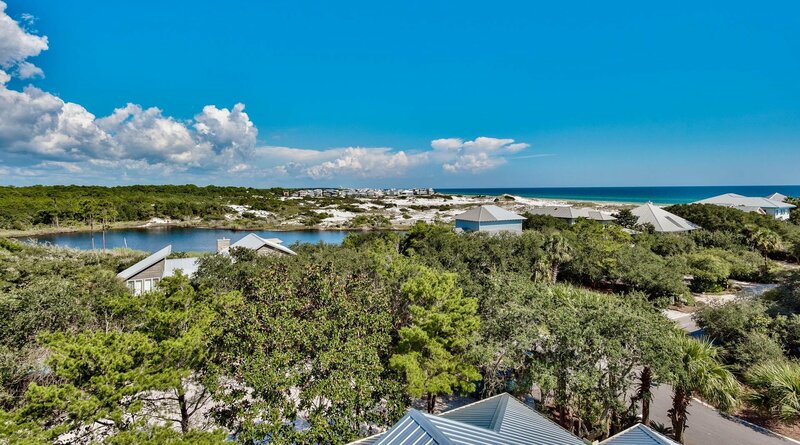 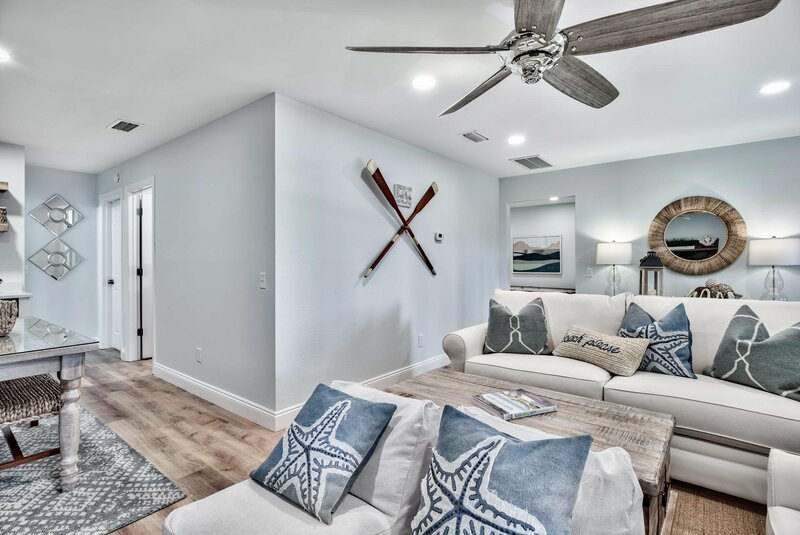 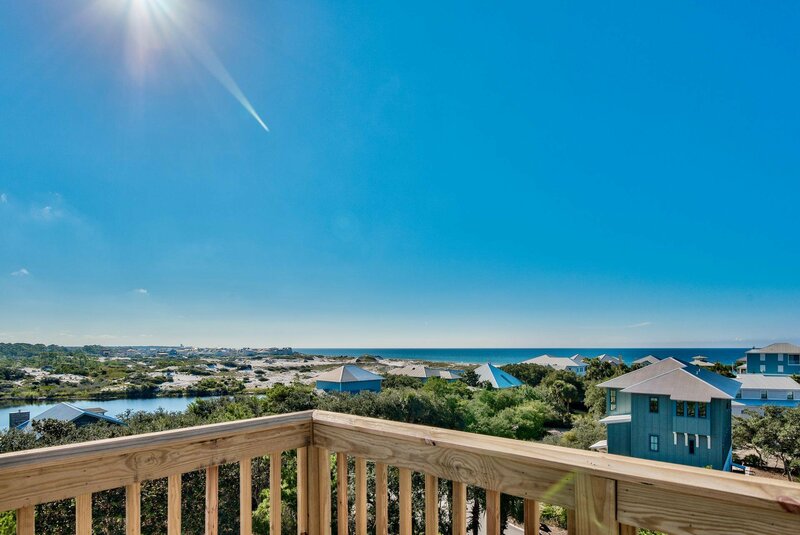 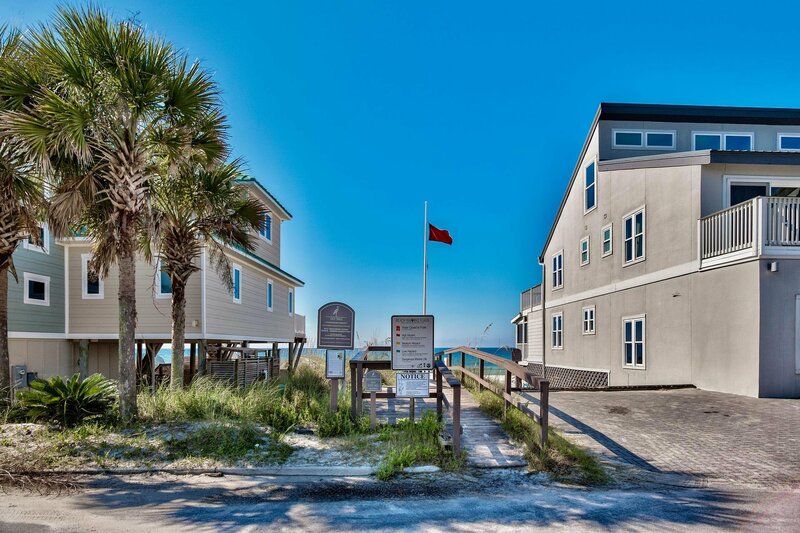 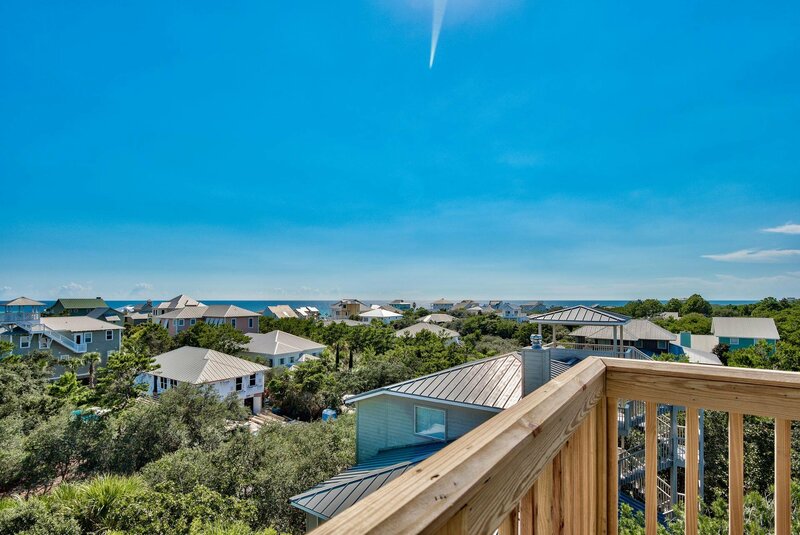 This rare and precious community is like an island surrounded by the protected sand dunes, scrub oaks and sea oats to insure privacy and seclusion. 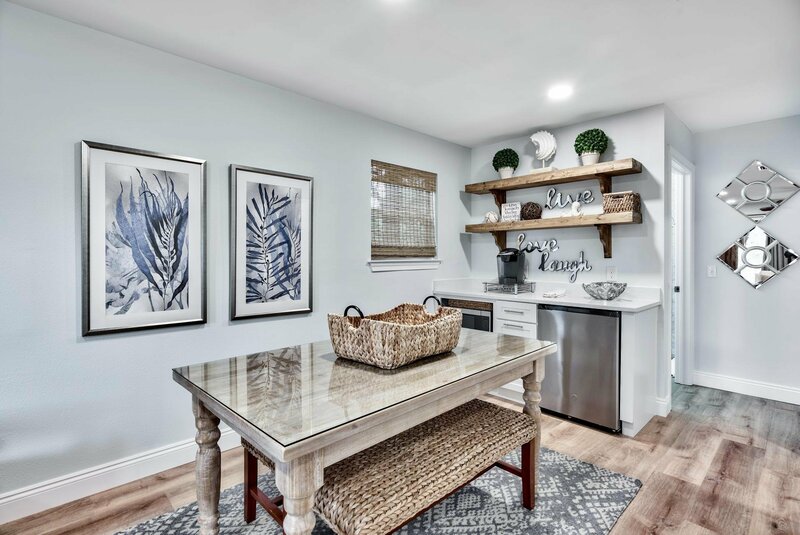 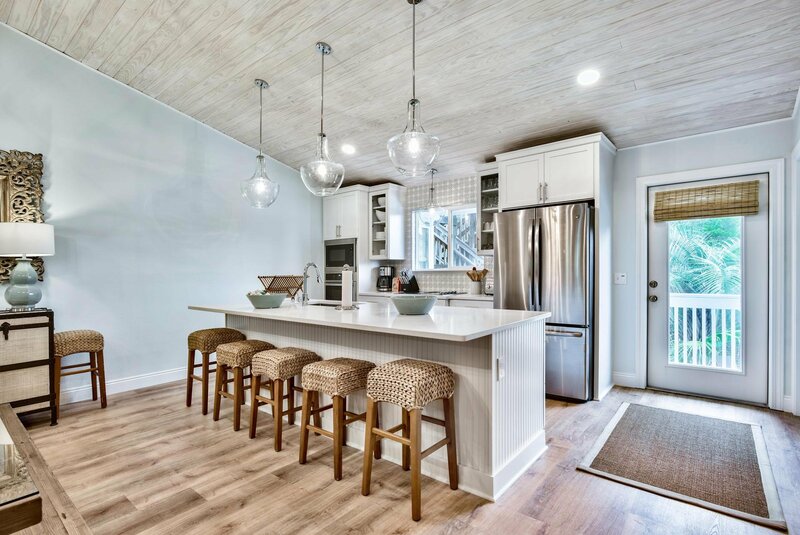 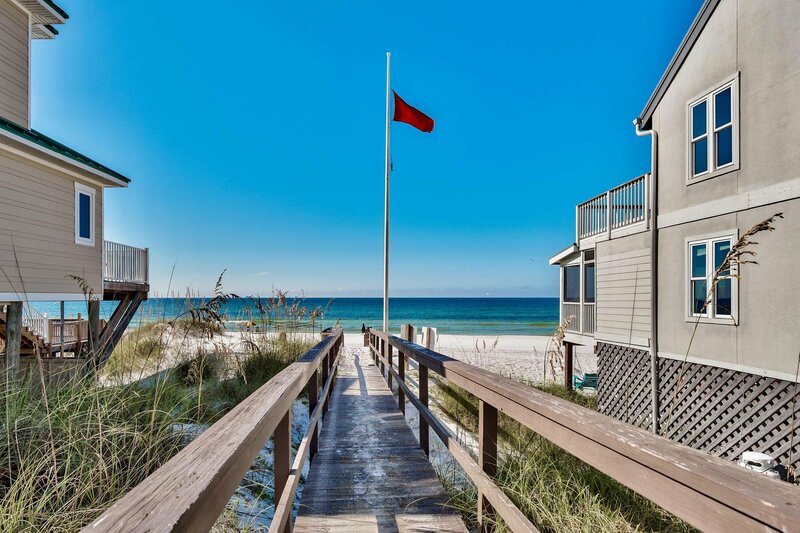 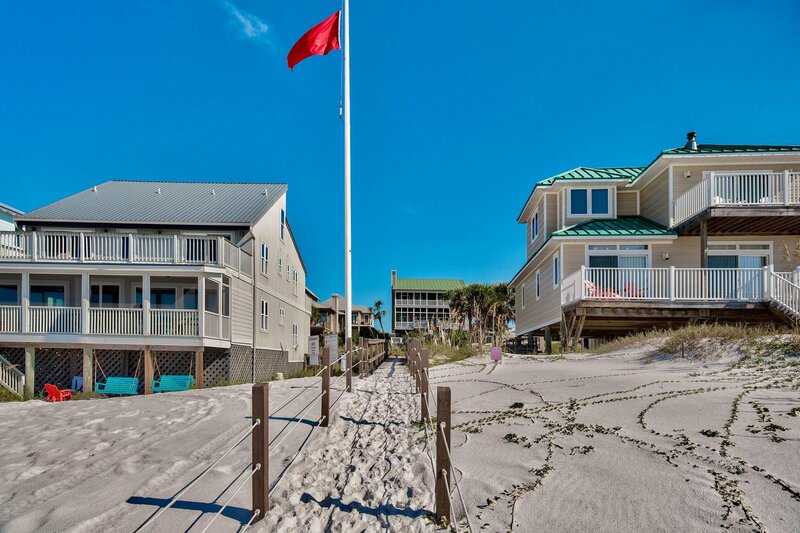 When you are ready for fun, just walk or ride your bike to the wonderful restaurants, shops and entertainment of Grayton Beach. 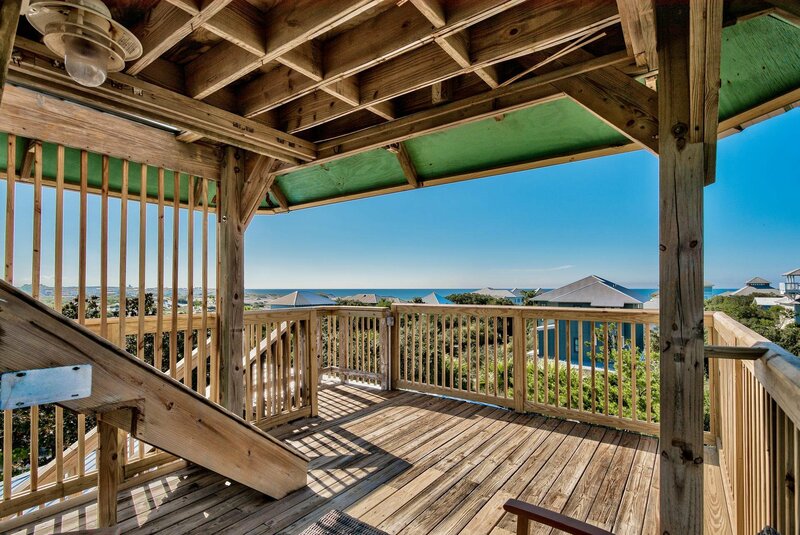 Start living your DREAM where every day is a weekend! 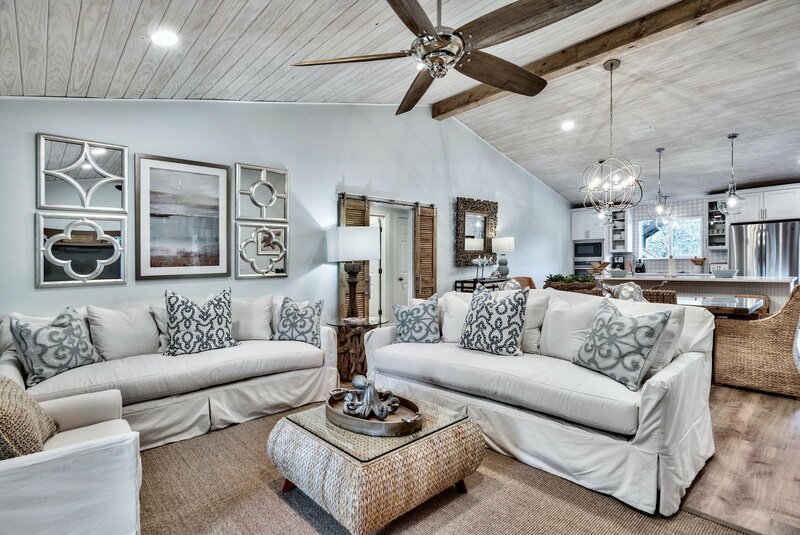 All information deemed correct but should be verified by Buyer.